Liverpool are not buying success, insists Jamie Redknapp. 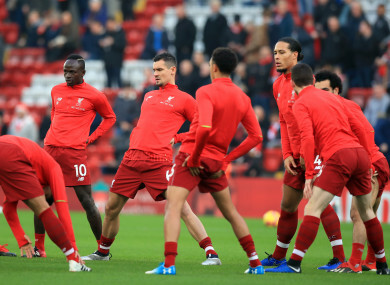 Liverpool players warm up (file pic). LIVERPOOL’S SPENDING IS not the reason they lead the Premier League title race, says Jamie Redknapp, with Manchester United having invested “nearly £200 million more over the last three seasons”. Jurgen Klopp has been backed in recent windows with considerable funds, allowing him to make record-breaking moves for the likes of Virgil van Dijk and Alisson. Some impressive recruitment has helped to bring more quality and greater depth to the Anfield ranks, with the Reds reaping the rewards. They are now six points clear of the chasing pack heading towards 2019, with Redknapp claiming careful management and player development has been as important as big-money additions. The former Reds midfielder told the Daily Mail: “It is true that Klopp has been able to splash the cash in the last 12 months. Since January, Liverpool have spent more than £250 million on Virgil van Dijk, the Premier League’s best defender, Brazil’s No 1 goalkeeper Alisson and bolstered their midfield. “But spending power alone is not why Liverpool lead the Premier League by six points at the season’s halfway stage. “Manchester United have spent nearly £200m more than Klopp over the last three seasons and at no point have they looked like title contenders. The Liverpool team who thrashed Benitez’s Newcastle 4-0 included an academy graduate, Trent Alexander-Arnold, an £8m left back, Andrew Robertson and Xherdan Shaqiri who — at £13m from Stoke — is proving to be one of the bargains of the summer. “Klopp is a manager who not only has an eye for a good player but improves them, too. Mohamed Salah was not a 40-goal forward and a contender for the Ballon d’Or when he arrived at the club. “Joe Gomez has been transformed into a first-choice centre half for England, a player who before his injury was keeping a World Cup finalist in Dejan Lovren out of the Liverpool team. “Having left the comfort zone at Arsenal last season, Alex Oxlade-Chamberlain looked a certainty for England’s World Cup squad before damaging knee ligaments in the Champions League semi-finals. Having made their way to the summit, the Reds now have a couple of potentially pivotal fixtures approaching. Klopp’s side are set to wrap up 2018 with a home date against Arsenal on Saturday, before then opening the New Year with a trip to Manchester City. Email “‘Man United have spent £200m more than Klopp’ ”. Feedback on “‘Man United have spent £200m more than Klopp’ ”.